The Kayenne goggles have expanded lenses for added vision. The low profile frame makes for excellent hydrodynamic properties. 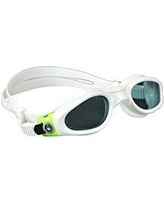 An excellent choice for both competition and recreational swimmers in either the pool or openwater.